Based in Dunning, Scotland, Jeni MacNab started writing in 2009 and has written a book about mindful eating called "Hot Chocolate for Your Soul," which was published early in 2010. MacNab has a Bachelor of Science in health studies, is an R.G.N. and has other qualifications in counseling, kinesiology, aromatherapy and meridian energy therapies. Hemp oil is made up of omega-6 and omega-3 essential fatty acids, according to Ratical.com. A combination of essential fatty acids are necessary for healthy cell production and good skin health. Many of the Western diets today do not contain a good balance of omega-6 and omega-3 essential fatty acids. Including hemp oil in your diet provides an excellent source of these two essential fatty acids and is also a very good nutritional source. Providing this balance to your body will help improve any chronic dry skin conditions such as eczema or dermatitis. Hemp seed oil is also rich in gamma-linolenic acid, or GLA. This is another type of omega-6 fatty acid and, according to Ratical.com, it has a number of skin health benefits and anti-inflammatory properties. GLA is probably better known as evening primrose oil or borage oil; however, opinion is divided regarding the benefits of adding this oil to your diet. According to a study conducted in Finland, hemp seed oil helps alleviate dermatitis, an inflammation of the skin. This is due to the balance of omega-6 and omega- 3 fatty acids. The study was carried out in 2005 by researcher J. Callaway and published in the 2005 "Journal of Dermatological Treatment." Callaway found that symptoms of skin dryness and itching significantly improved in dermatitis sufferers after using hemp seed oil for 20 weeks. Hemp seed oil is used in various cosmetics including skin creams, shampoos, shaving cream, lip balms and sun creams. Although there are many claims made about hemp oil's effect on skin, as yet these claims remain unsubstantiated according to The Cosmetics Cop. Hemp seed oil is a natural moisturizer and can help to make your skin feel smooth and soft while acting as a barrier and preventing moisture loss. Hemp is also rich in vitamin D, which is necessary for calcium absorption to help achieve soft, smooth and hydrated skin. People may ask if hemp oil has any psychoactivity or if it is actually safe to take. According to Ratical.com, during the manufacturing process any psychoactive compounds are removed. 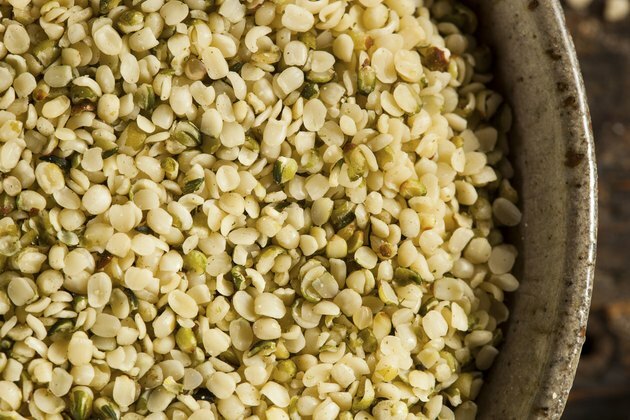 The strains of hemp seed that are grown and used for oil production have a very low resin content to begin with, and once they go through the manufacturing process and are washed and pressed, the final product or resin is free of any psychoactive compounds or tetrahydroconnabinol (THC). What Are the Benefits of Hemp Lotion?